RA is a chronic (long-term) disease that causes pain, stiffness, swelling and limited motion and function of many joints. Let it be known that Rheumatoid Arthritis is a serious disease that needs awareness with our RA Awareness Hooded Sweatshirt. Our RA Awareness Hoodie is great to wear at walk events or any day you simply want to show your support. 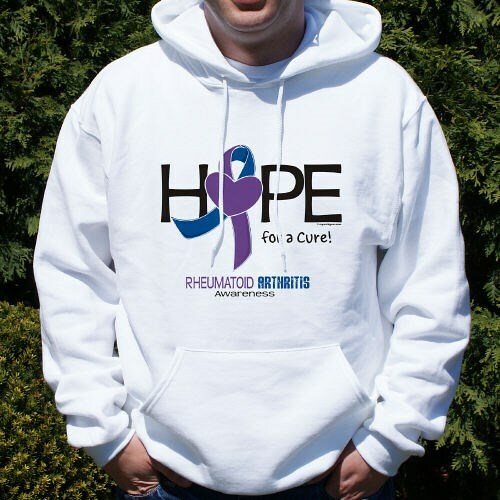 Our Hope For A Cure Rheumatoid Arthritis Hooded Sweatshirt is available on our premium 50/50 cotton/poly blend hooded sweatshirt, machine washable in youth sizes S-L and adult sizes S-2XL. Additional Info RA remains a serious disease and one that can vary widely in symptoms. Help people become aware with Arthritis Awareness Apparel & Walk Gear. By becoming an advocate, you will educate those with little understanding of this disease. This RA Awareness Hoodie is an excellent choice for your next walk event & looks great when you include our RA Awareness Water Bottle & our RA Awareness Key Chain as well.